My Schupfnudel recipe was the second place winner of the Idaho Potato competition. Schupfnudeln or finger noodles are another way of serving potatoes from the master of potatoes, the Germans. I love these old recipes, such important pieces of German cooking history that have been passed down for generations. Schupfnudeln are a type of dumpling or thick noodle in southern German and Austrian cuisine, and in a nutshell is comfort food at its finest. The dough is made from mashed potatoes, whole wheat flour, AP flour, egg yolks, salt and a pinch of nutmeg. Usually the dough is made with Ap flour, in this recipe I used both whole wheat flour and AP flour. I love the flavor of the whole-wheat flour and the fact that whole-wheat flour is made from grains that have not undergone heavy processing giving you better nutritions and more fiber. The potato dough is rolled into logs and cut into about 1 1/2 inch pieces. Each piece is formed into a tapered cylinder by rolling between your hands into little ropes the size of your finger. They’re pan-fried in butter, which gives the noodles a delicious crunchy surface. What’s not to love? Schupfnudeln or finger noodles can be served sweet or savory, however, it is necessary that the comparatively flavorless noodles incorporate the flavor of other ingredients. 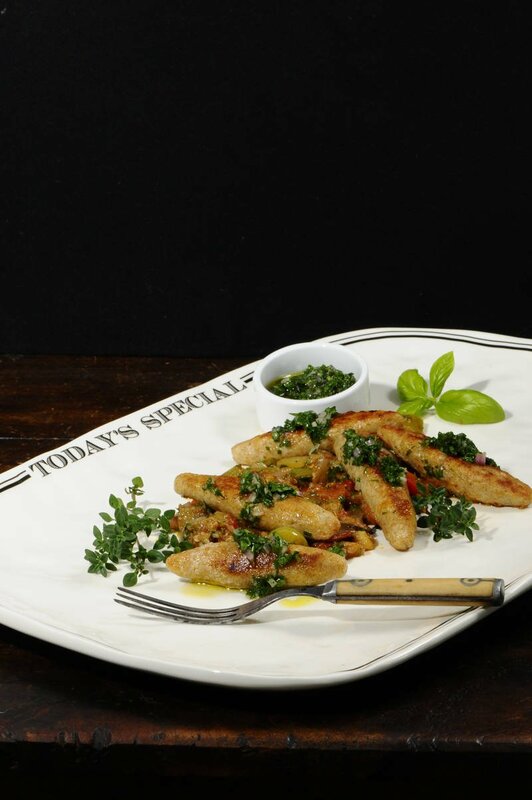 By completing the dish with the addition of a great summer ratatouille and sauce verte makes the perfect combination. 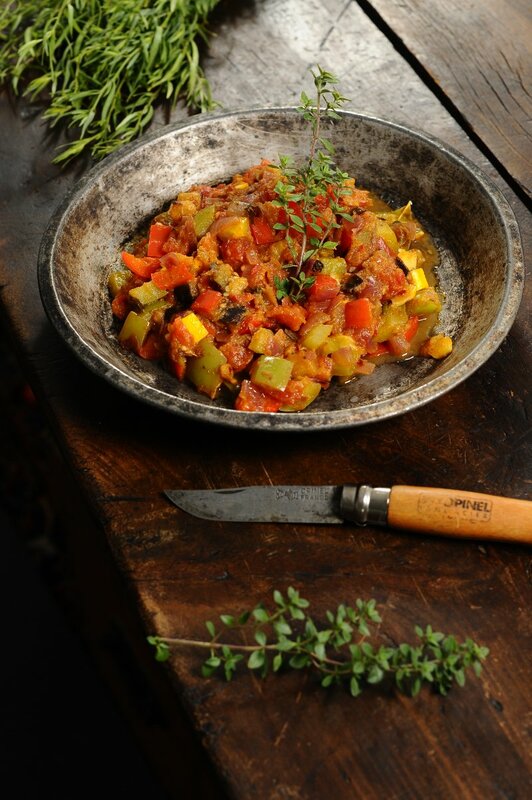 In the summer months, ratatouille is a staple for me. I love a good ratatouille that I serve warm or chilled. I may serve it with a simple piece of grilled fish or a grilled skirt steak. I often I serve ratatouille on a piece of grilled baguette with a little feta cheese which makes a great snack or light lunch. 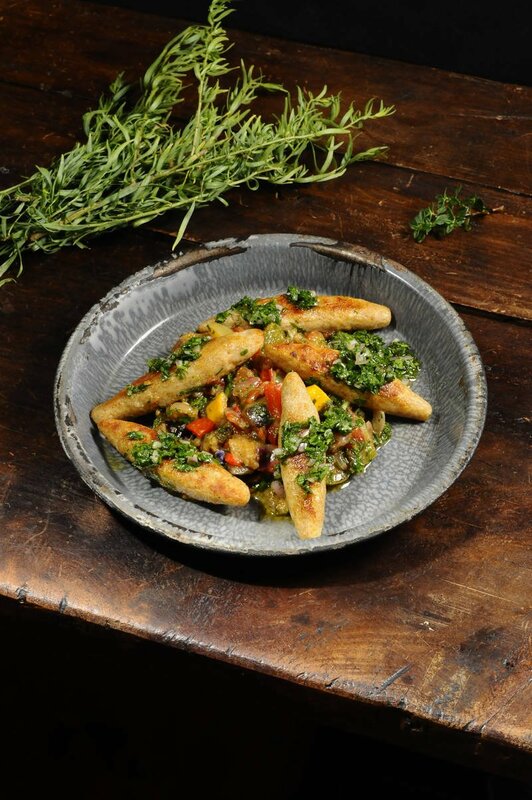 COOK RATATOUILLE: Toss cubed eggplant with teaspoon of salt and let sit for about 20 minutes. With paper towel pat the cubed eggplant dry. In Dutch oven heat 2 tablespoons of olive oil, add the cubed eggplant and sauté over medium heat until lightly browned. Remove eggplant and set aside. Add remaining extra virgin olive oil to the same Dutch oven, add diced onions and cook until translucent. Add garlic, sprig of fresh thyme, chopped fresh basil, crushed fennel seeds, red pepper chili flakes, peppers and squash. 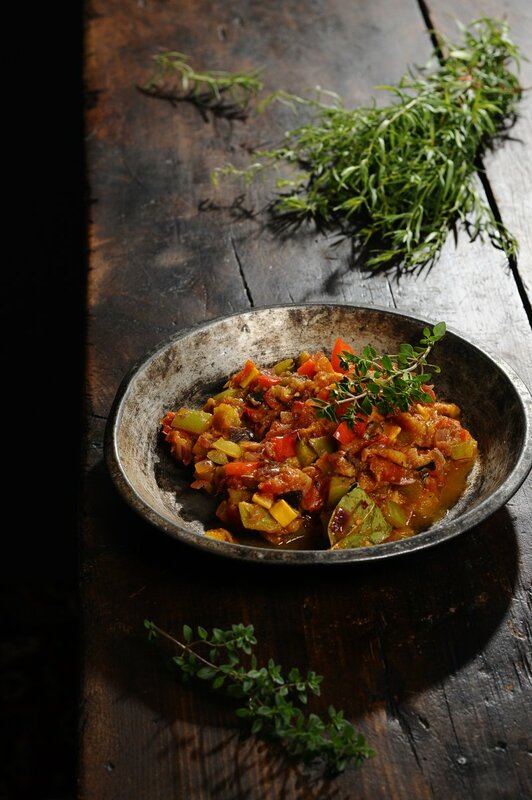 Stir in eggplant, add red wine vinegar, cover Dutch oven with lid and cook ratatouille over medium heat for about 20 minutes or until all vegetables are soft. Add sea salt to taste. 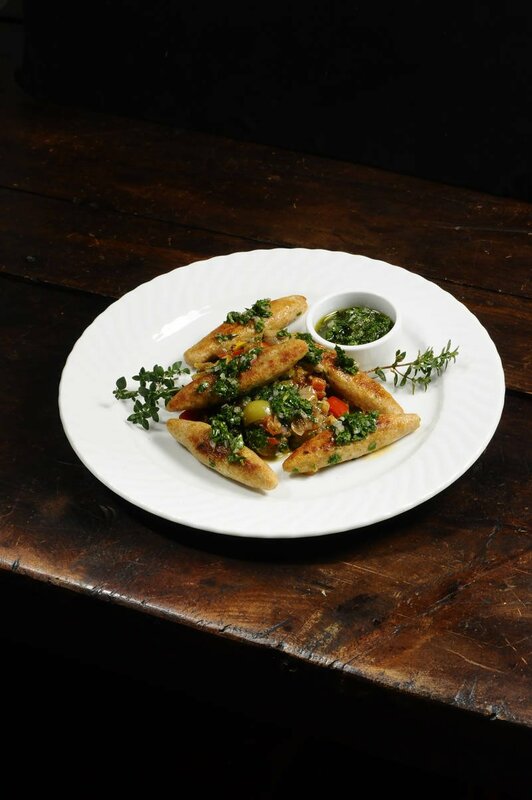 MAKE SAUCE VERTE: In a bowl blend chopped flat leaf parsley, chives and cilantro with extra virgin olive oil. Add diced shallots, minced garlic, red pepper chili flakes, salt, pepper and red wine vinegar. Let sit for about 10 to 15 minutes to develop flavor before you serve. MAKE SCHUPFNUDELN: Peel potatoes. Cut into quarters and cook in salted water until soft. Place potatoes on sheet pan and heat in preheated oven at 220 F for 10 minutes. You want to remove as much moisture as possible. Push cooked potatoes through a potato press and cool. Add egg yolks, all-purpose flour and whole-wheat flour, salt and nutmeg. Mix to a smooth dough. If needed, add a little more flour to the dough. Place dough on a floured board and form into a 1 inch thick log. Cut the log into about 1 1/2 inch inch pieces and form each piece into a tapered cylinder by rolling between your hands. It should be thick in the middle and pointed on the end. Bring salt water to a boil, add Schupfnudeln. Reduce heat to a simmer and cook for about 6 to 8 minutes. With slotted spoon remove from water. Melt butter in a sauté pan, add Schupfnudeln and sauté to a golden brown.